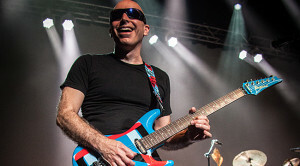 Dubbed Surfing to Shockwave, guitarist Joe Satriani’s current tour offers a 30-year career retrospective of the man’s back catalogue, though he promises set list will also include some “gems” pulled from the Satriani songbook that may not have ever been performed live, or in some cases, for a very long time. Expect to hear hard rock instrumentals such as “Big Bad Moon,” “Friends,”“Crystal Planet,” “Not of This Earth,” “Luminous Flesh Giants” and “If I Could Fly.” Satriani recently phoned to talk about the tour. What made you want to turn this into a 30-year career retrospective tour? It wasn’t my idea but it has been 30 years since we released Not of this Earth, which came out in 1986. I wasn’t keeping track of it. I think that our friends and promoters around the world were keen on getting us to do an “evening with” show. We own the stage from the first song to the last. This allows us to play a lot more material and I think the fans really appreciate it. What’s it been like revisiting the old material? I enjoy it. For me, it’s like I’m getting a chance to work on it again. There’s that old saying that records aren’t finished; they’re abandoned. When you’re busy trying to make a record, someone taps you on the shoulder and says your time is up. The tour is the last chance to improve the songs. I think Not of this Earth still sounds contemporary. We really tried to be different. My co-producer was also my engineer — it was just the two of us doing most of the record. He was my live sound engineer for tis power pop trio the Squares that I was in. We had experience in the studio and we were trying to compete with other bands. I said, “Screw trying to fit in. Forgot about getting a record deal. I don’t have to answer to anybody.” That’s what we did. We did things different on purpose. If we heard that this amp was the best amp, we would use the other amp. Everyday in the studio was an invention. What made you want to first pick up a guitar when you were a kid? It was Jimi Hendrix. I started out as a drummer at the age of 9. I took lessons. After three years, I knew I wasn’t destined to be a good drummer because I couldn’t get all four limbs to work together at the same time. During that time off from trying to be a drummer, I was getting into the music of my siblings. I was a Hendrix fanatic. The day he died, I decided to be a guitarist. I was getting used to the idea that the guitar was way cooler than the drums. You could play it on your own. I remember thinking I should get my hands on one as soon as possible. He provided me with that courage to put up with that noise I made when starting out. Hopefully, you’re slightly deaf to that when you start out because everyone starts out poorly. How’d you wind up as an instructor? Purely by accident. I started playing professionally almost immediately. We were playing high school dances and battles of the bands. The other kids would see me play and they started asking for lessons. I thought it would be a good way to pick up money for strings. I thought it was normal to teach. I got in the spirit of things very easily. You’ve had some great students. I am the luckiest guitar teacher ever. One of my first students was Steve Vai. At what point did you establish your own sound as a player and how’d you go about achieving that? I’m forever a student of music in general and I try to do my best. I’m just grateful the fans continue to be there. Were you always interested in science fiction? As a young kid, I was influenced by the hysterical television shows. My dad was science minded. I grew up as a believer in humanity’s ability to move forward by adopting a scientific mind. I started naming these albums with sci-fi references. Not of this Earth was the title of a bad science fiction movie from 1959 that my high school friends and I had memorized. That was the only reason I picked that name. I wasn’t trying to come out as a sci-fi nut. Surfing with the Alien was going to be Lords of Karma but a British journalist told me he hated the title. So I called the label immediately and said, “Let’s call it Surfing with the Alien.” I love science fiction as a genre of writing ever since I was introduced to Ray Bradbury and even today, I think sci-fi writers are amazing. I’m just now getting through The Martian Chronicles. You’re also playing songs from Shockwave Supernova. How do those songs fit with the old ones? Some of the stuff fits really well with the older records. The nature of the story is about me and the alter ego that I supposedly created in order to function in a public way. I’m generally a shy person. The last thing I would do is step up in front of an audience. I was having a funny daydream. I started thinking it would be funny if that alter ego took over. I wrote the album around that concept but lightly. I thought it would be good if it was an internal struggle. I didn’t want to make it a musical or concept album. It got me to laugh at myself as a shy and introverted person yet an extroverted performer. As the story unfolds, the two characters go at one another. In that way, the album fits with the retrospective show. Can you talk about Little Kids Rock, the organization you support that benefits music programs in schools? It’s a great charity run by some really special people who have hit upon a perfect formula for fixing a problem and filling a need in schools today. Communities have had education systems that have suffered budget cuts. This is devastating. We need to be able to express ourselves physically and artistically. Sometimes when you take on the whole thing at once, you’re in a political mess. Little Kids Rock went into one specific direction. They wanted to get guitars in the hands of students right away. We go from community to community and get guitars into the classrooms. That’s what we do. It’s a great program. If anyone wants to help out, every dollar helps counts.